A lonely grave in a delightful bush setting. The story of women on the diggings is largely untold. Only rarely did women work as diggers in their own right. Often, though, they worked side by side with a husband, brother or father. 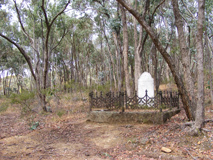 The grave of Elizabeth Escott and her daughter Fanny lies in bushland on the east side of the road to Fryerstown. When Elizabeth's husband died, she left England with her eleven children to make a new life in Australia. She was one of many who were beaten by the hardships of life on the diggings. Fanny was sixteen when she died of consumption at Blacksmith's Gully in 1856, and Elizabeth died six months later. Another daughter, Mary, had died in 1855. Her descendants have carefully maintained the lonely grave in the bush.